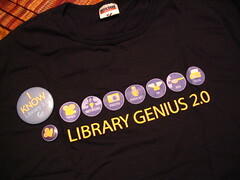 Thanks to Sean and the folks at ACPL, this great T-shirt arrived via the postman this week. I truly love the icons, but the RSS (aka spoon fed) is my personal favorite. What a natural choice. or also in other options here. Love it! Reminds me so much of a scout sash with all the project badges. Do they still do those?